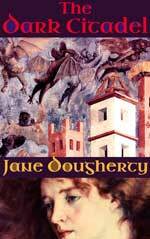 The author, Jane Dougherty, gave me this novel in exchange for my review. As a young teen I read Paul Bunyon’s “Pilgrim’s Progress” over and over. It wasn’t just that following Christian’s tale was interesting, but I felt like what I was reading was really saying something. The Dark Citadel (The Green Woman) is the “Pilgrims Progress” for children of a modern age. I am simply blown away by the craftsmanship inherent in Dougherty’s world. Deborah has been poorly treated since being torn from her family and placed with “givenparents”. Each family is permitted a boy and a girl and if they have two boys one will be taken and replaced with a girl. The working class in The Dark Citadel (The Green Woman) is know as “Ignorants”. They are considered the lowest of the low. They are less moral, less clean, less human than their counterparts. Zacariah’s givenmother works in the House of Births and tells a neighbor of the horrible deformities of the babies born to the Ignorant class and celebrates the impending massacre of that class. She shows the neighbor the syringe she uses to stop the heats of the babies and the skin just crawls. Immediately the mind is drawn into the recent past of our civilization. How do you justify atrocities? You take the humanity of the person your subjugating. In the mind the person is no longer a person but a thing. A thing from which you must protect yourself at all costs. This society needs a hero, and the reader hopes that Deborah could be that hero. The plot is quite well thought out in given us action while introducing us to this city in a dome. The structure of the societal base is quite complex and multi-layered. Women are beneath notice and as a physical manifestation of that they must stay covered. Part of Deborah’s breaking free from the establishment is breaking free of the rules. Like the bra burners of the 1960s, she’s ready to shed the manacles and the man is fighting her and yet only they know why she’s too valuable to punish too harshly. Paths cross in unexpected ways and we see the fear. Dougherty does the impossible in making the story and the structure so deeply complex and yet so simple and easy to follow. Zacariah and Deborah may have paths that intersect but they also have help. The Ignorant class turns out not to be as unhuman as they’ve been led to believe. The men and women help the teens despite the risk to themselves. The characters, no matter how minor, are not cardboard cut-outs. They are richly developed from the guard who uses the subjugation of the Ignorants as his excuse for cruelty to Abbadon, the dark lord who is discreetly looking for control. Deborah starts the novel as an angry teen and develops in a very real way as the story progresses. She’s facing things she never had to and is fortunate to have help along the way. I cannot imagine living in such a dark society. The Dark Citadel (The Green Woman) is beautifully constructed and a series I will continue to read. I was in this story with Deborah. I feared for her as the Controller plotted, and sobbed with her when she found her sick father, and marveled with her as her destiny became clear. There was not a single thing I did not like about this book. Because of scenes of violence I would recommend The Dark Citadel (The Green Woman) for older teens and adults. If you like dark fantasy, pick this one up today. I’m on the edge of my seat to find out what happens next. Jane Dougherty was raised in Yorkshire and now lives in Bordeaux with her family and dogs. The Dark Citadel (The Green Woman) is her first novel. Check out my review of a trio of stories In the Beginning that serve as a preface and afterward to The Dark Citadel (The Green Woman) and give background information about the core characters. For more information about Jane Dougherty and her work, visit her website. You can connect with Jane Dougherty on GoodReads, Facebook and Twitter @MJDougherty33.